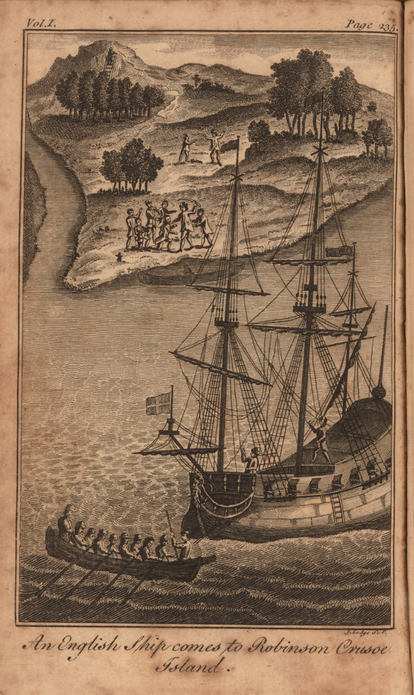 "An English Ship comes to Robinson Crusoe Island.," engraved by J. Lodge, 1778, John Carter Brown Library. 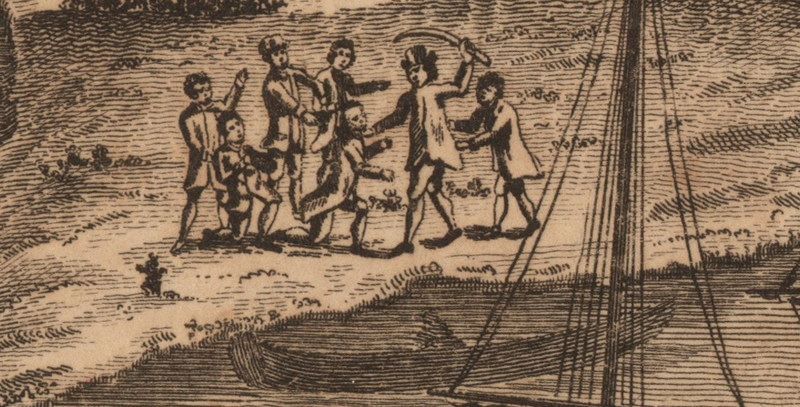 Lodge, the engraver of this plate for a 1778 edition of Swift's novel Robinson Crusoe, clearly does not possess the same skill as Carrington Bowles' prints of the same story. This scene appears late in the story, when an English ship arrives at the island. Its crew has mutinied, and seeks to maroon their captain on the island. Two of the crewmen work the lines aboard the ship while the rest of their mates head ashore. 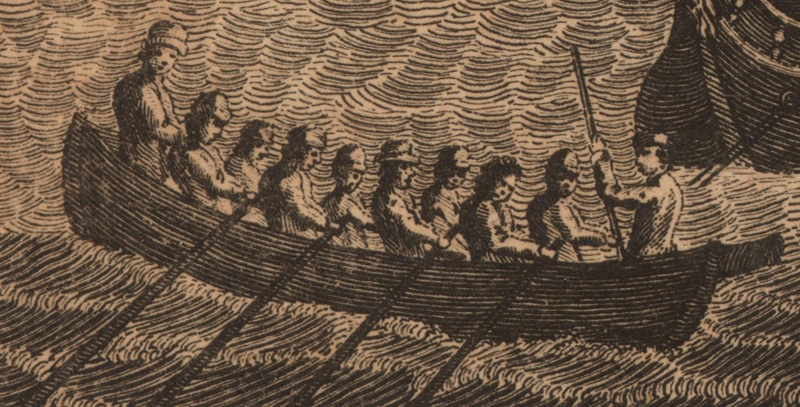 They wear single breasted jackets that are longer than are common for eighteenth century sailors, perhaps a nod to the setting of the story: 1689. Their hats also have unusually tall crowns and short upturned brims. My guess would be that these are dutch caps. The sailor farther aft of the main wears a close fitting pair of trousers. This boat is loaded with ten men, matching the number Crusoe describes as rowing ashore wehn their first boat, bearing the captain and loyal crewmen as prisoners, failed to return. The coxswain wears a short cocked hat, or perhaps a japanned leather round hat. The rest of the men wear a variety of headwear that could be dutch caps and round hats. Ashore, Crusoe bears a sword over the mutineers and freed sailors. Just offshore we can see the vague outline of a boat, one that the captain and Crusoe scuttled to prevent the muniteers from escaping back to the ship and returning in force. Crusoe is looking a bit ragged in his hat, single breasted jacket, breeches, and stockings. The others wear jackets of similar length, breeches and stockings, Only one of them wears a hat, which is an odd sort of fur or thrum cap.